Scudamore’s Super Stakes is a new racing-themed video slot from NetEnt, and it pays tribute to the late Peter Scudamore. The game is built around a 5-reel, 3-row format and there’s a total of 20-fixed paylines in the game. You’ll be able to play the game from between R1 and R1,000 per spin, and this allows players on all budgets to enjoy the game’s action. As we’ve come to expect from NetEnt’s slots, Scudamore’s Super Stakes is visually really impressive. The reels are set on top of a horse racing track, and you’ll see the green track running behind the reels. Furlong posts mark the distance markers along the way, and some realistic sound effects and game-animations ensure a pretty realistic playing experience. The symbols on the reels are varied, and include playing card values, including 10, jack, queen, king, and ace (as the game’s low-value symbols) and four different jockeys, as the game’s high-value symbols. Peter Scudamore himself is the game’s wild symbol, and he substitutes for all other symbols in the game, aside from the scatters. Scudamore’s Super Stakes offers up three bonuses. The first is known as the ‘Random Wilds’ feature, and this can trigger randomly on any spin during the base game. When it does, between two and five of the wild symbols are added randomly to the reels which can help you with making some wins. The second feature is the Bet Slip feature. In the base game, you’ll notice on the right-hand side of the reels there’s a ‘Bet Slip’ which you can click. If you want to play this bonus, you’ll get to place a real-money wager on one of the betting options. You need to choose one symbol, and guess how many of that symbol will land in view over the next 10-80 spins. It will then pay out the multiplier times your stake if the event you’re betting on does indeed happen. Now, onto the main bonus round; Peter’s Classic Cup which is triggered by landing the Trophy scatter symbols on reels 1, 3, and 5. When the feature activates, you’ll be taken to a new set of reels that are built around a 5-reel, 4-row format with 32 paylines. Before the spins begin, you’ll be prompted to pick one of four horses; Divine Fortune, Berry Max, Gonzo’s Quest and Tin Foil Hat. 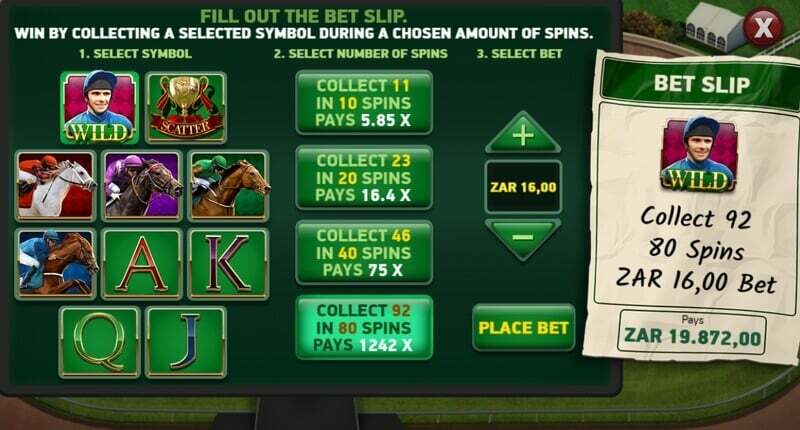 During the bonus, each time your horse (or its corresponding symbol lands in view), your chosen horse will advance a certain number of positions on the racecourse. If the horse you picked comes first, you’ll win the multiplier prize! It’s possible to win up to 5,000X your stake in this bonus, so it’s fair to say it’s one of NetEnt’s most volatile bonuses to date! When it comes to good-looking video slots, we’re used to seeing NetEnt as a market leader. Almost all of their games are built to an incredibly high standard, and Scudamore’s Super Stakes is no exception. The game looks great, plays well, and the gameplay is exceptionally fluid. It’s also fully mobile-optimised, and this enables you to enjoy the action from your mobile devices, as well as desktop computers and laptops. One thing we especially like is the fact that NetEnt has upped the volatility in this game. The fact that you can win up to 5,000X during the main bonus round means players in search of super high-variance games will find something to suit their tastes, and there’s also low-variance options available as well, so there is plenty to go round. Overall, Scudamore’s Super Stakes is a top slot, and it’s recommended even if you don’t like horse racing! It’s all about the bonus features, so keep an eye out for them during the base-game, as they’re where the main money is found. Game description: Scudamore’s Super Stakes is a game that is full of excitement and I feel it is suited for everybody, even if you're not a fan of horse racing. 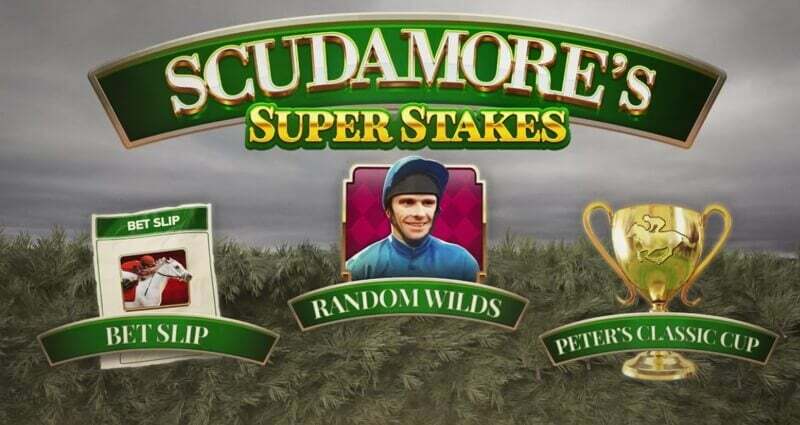 Scudamore’s Super Stakes is a new racing-themed video slot from NetEnt, and it pays tribute to the late Peter Scudamore.